With a great exhalation of relief, I can finally put the first week of fieldwork at Carson behind me – well, at least for the time being, as I begin preparations for week 2. Sitting here at the Oxbow Restaurant in Clarksdale, Mississippi, enjoying excellent tuna tacos and well-made sweet tea, it dawns on me that summarizing this week’s findings is easier said than done. As always, Carson leaves me more confused than ever, as if every time I pick up a couple of marbles I fail to notice that three more have fallen out of my bag. So, with such convincing and confidence inspiring proclamations, I begin my Carson post. Preparations for fieldwork took a couple of days to get in order, but by July the 4th, Euan Wallace (a Tulane undergraduate) and I finally got to work on a 1 x 2 m trench in the western flank of Mound D, the mound which used to serve as the platform for the original Carson family plantation house. 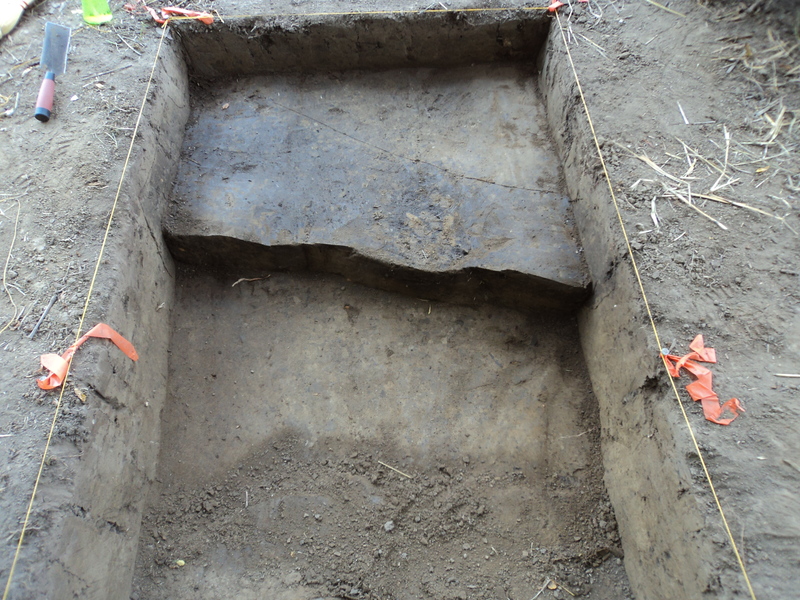 I decided to dig in 10 cm arbitrary levels following the natural ground surface to maintain the possibility of keeping artifacts within cultural strata – while a stair-step trench may have proceeded more quickly, I didn’t want to mix ceramics from different strata. 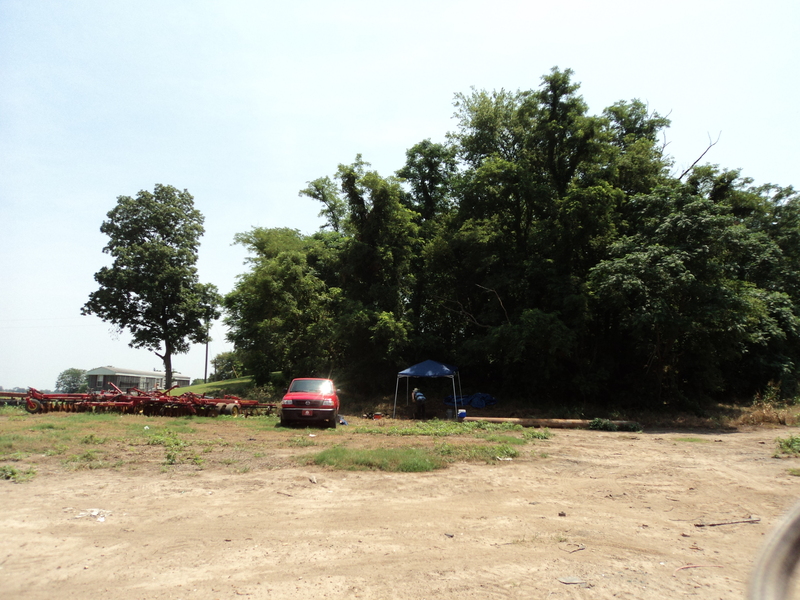 Partially covered in trees and mowed down grasses, today no house is visible on the surface. If one were to brave the snakes and poison ivy however, you would discover there are brick piers and a cistern hidden in the wooded part of the mound – given my poison ivy woke me up this morning at 5am, take it from me, its not worth it. Dirt moving proceeded fairly slowly at first, as Euan and I worked out the bugs in our system, but by this Friday, we’d figured it out and were making good progress. July 4th was also a wonderful day because the UNC students had an amazing cookout and Independence Day celebration – kudos to the whole crew, but Mr Bojangles deserves a special shout out for his some-kind-of-berry cobbler with sprinkles. In our excavation unit, Euan and I are mostly finding later Woodland Baytown wares in the mound-fill, which simply means the dirt mined for the mound (wherever it came from) was full of Late Woodland pottery. 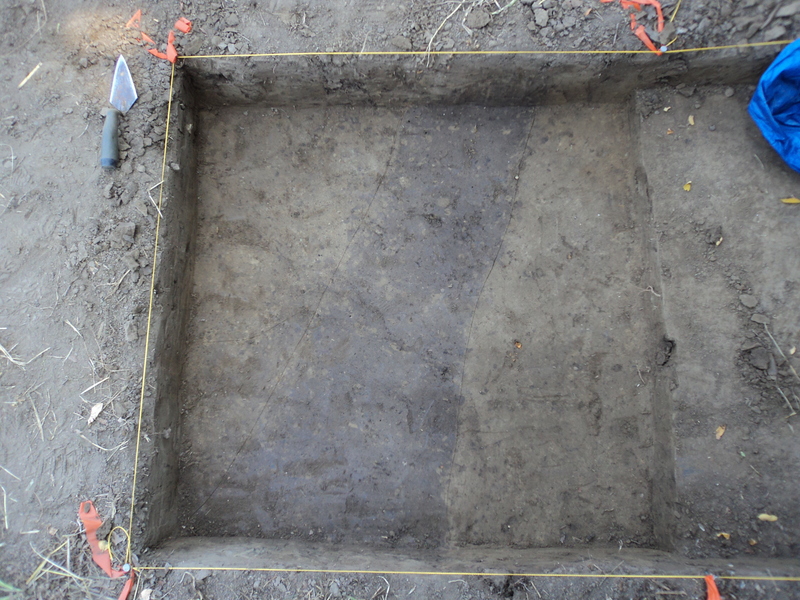 However, excavations in our westernmost unit started to reveal a roughly north to south (about 25 degrees east of north) dark linear stain. In our first level we didn’t make much of Feature 1 (I initially thought it was a plow scar), but by the middle of the second 10 cm arbitrary level, when the stain started to appear fairly well-defined, it became apparent we may have an important feature. John Connaway’s suggestion of wall trench has since vexed and intrigued me. To get a clearer picture of the the linear stain (named Feature 1), we removed a third arbitrary level from the unit immediately east of Feature 1 (TU2), and then proceeded to dig from the east to the west in TU1, removing the soil matrix and sifting it seperately until we encountered the darker soils of Feature 1 – and sure enough, it stayed discreet and well-defined within the soil matrix. Plan views of the feature demonstrate it didn’t move around within the unit, although as we dug deeper in TU1L2, it did get wider towards the SW. As of right now, Feature 1 appears well-defined within the surrounding matrix, and it appears to continue deeper into the sediments – if indeed this is a wall-trench, then we might expect it to continue for about 1 to 1.25 meters below from where we detected it (based on comparisons with wall trenches found close to the summit of Mound C). Ceramics from the feature have yet to be analyzed, but I cant wait! Feature 1 is still present at the bottom of the excavated portion of TU1 - trowel is pointing west - is that a post in the trench? We have also started sediment coring at the site, and in Core 28, excavated on the western toe of Mound D, we have found evidence of the crevasse splay we detected in the earlier 2009 coring campaign. This might indicate that mounds D, B, and E were all built after the crevasse happened – this supposition is based on a minimal number of cores, and over time with additional coring, I may find data to corroborate or revise this idea. A small version of Mound C, however, was built on a dried out sharkey clay backswamp – the crevasse splay seen under Mounds D, B, and E, actually abuts the early version of Mound C. At some point after the flood deposit dried out, the second stage of a much larger Mound C was constructed. The research plan for 2011 is to trace the flood event across the landscape between Mound C and D, and to evaluate the nature and scope of the crevasse deposit, as well as much more recent 18th and 19th century flood deposits likely emanating from the active channel in what is now Horseshoe Lake (cutoff in 1848) – those floods have left upwards of 2 meters of alluvium across the site. We also plan on coring just west of the set-aside where the village is located, as there may be the possibility of mound remnants on a higher ridge of land left relatively undisturbed by land leveling. Ok, enough said for now – these are just some initial thoughts and who knows what will happen at site, so, dont be too harsh if I’ve bored or confused you. And let me know your thoughts! – mounds with palisades/fences at the bottom (or top)? Flooded sites? How to dig 1.5 of dirt in about 12 days with really hard dirt? Suggestions? Very neat! I vote for identifying the linear feature as a wall trench, but I look forward to hearing more about what you find out–and if you have sherds from that feature, that’s great. Captain Morgan found a fence around one of the mounds at Bottle Creek, I think, but I would have to look back through Dr. Brown’s Bottle Creek book to confirm. It sounds like a good first week for you. Please greet all UNC and Ole Miss folks, and have fun digging. I’m voting with Shaman Rodning: wall trench. But it’s a 1×1 m unit that’s 20 cm deep, so it could be the sewer line from the house on the mound. I’m just saying…. 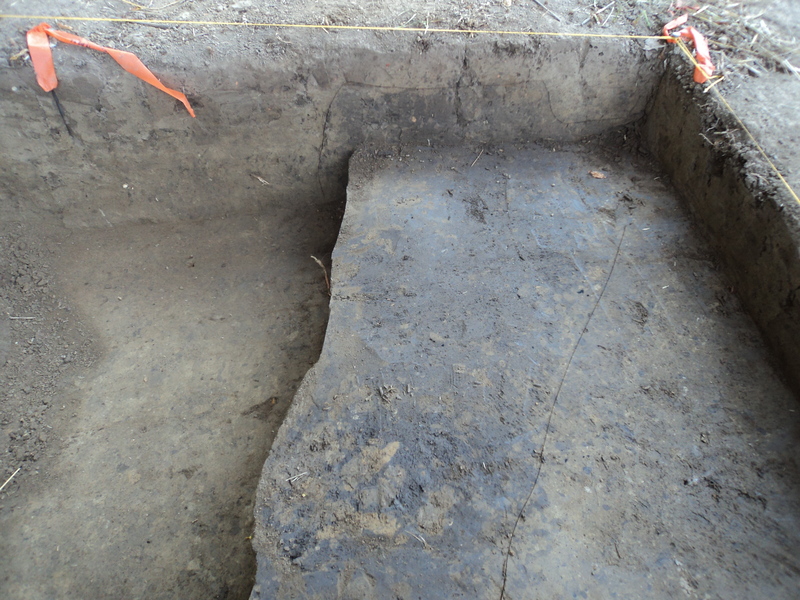 At Bottle Creek we found three sets of partially superimposed wall trenches and small post molds dug into the thick clay stratum forming the base of the mound. They seemed to have been situated at the inflection point of the slope of the clay base’s surface, and they could have encircled the mound (although it’s hard to say from a 1 m wide swath); therefore, I speculated wildly that perhaps these were fences used to maintain the shape of the mound as it was rapidly built, so that it conformed to the clay platform ‘template’ first laid down. But all this was deeeep down….